A rare find, this secondary market print is beautifully framed, with photos, in archival materials. This limited edition print sold out completely when it was issued in 1992. 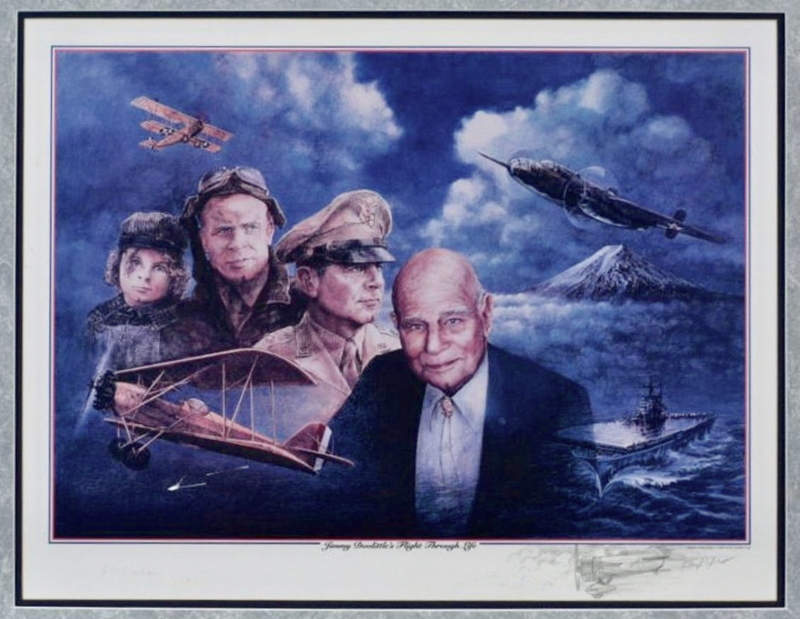 "Jimmy Doolittle's Flight Through Life," depicts the famed pilot in four stages of his life. Doolittle is shown as a young boy, dressed as he would have while living in Nome, AK, with a magnificent black eye from fighting. The next portrait shows him in his WWI era flight gear, then wearing his WWII era Army uniform, as he would have before the famous Doolittle Raid. The print gives a cinematic air to Doolittle's legacy, and shows a life richly lived. James H. Doolittle was the fearless leader in the successful Doolittle or Tokyo Raid of 1942, the first retaliation on Japan after Pearl Harbor. In the foreground of this print are the aircraft and vessels significant to Doolittle's life, the B-25 he flew over Japan, the USS Hornet (lost with all hands within months of the Raid), the Curtiss Biplane he flew in record breaking cross country flights, and the SN-1 in which he flew the very first instrument approach.